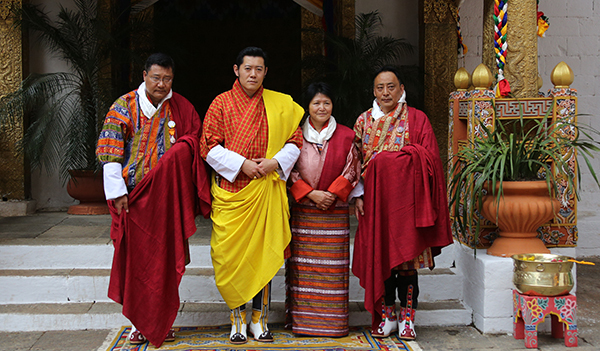 On the occasion of Zhabdrung Kuchoe coinciding with the Naming Ceremony of His Royal Highness The Gyalsey, His Majesty The King granted the Red Scarf to three individuals in recognition for their services to the country and people. One of the recipients is the works and human settlement minister, Dorji Choden. Lyonpo Dorji Choden is the first woman minister of the country. Prior to joining politics in 2008, Lyonpo has served as one of the first commissioners of the Anti-Corruption Commission. She is also the first woman engineer of Bhutan. Lyonpo has also worked as a consultant to various international agencies such as UNDP, UNICEF, and SNV, among others. Dratshang Lhentshog’s Secretary, Karma Wangchuk Penjor was also among the recipients. Before joining the central monastic body, Dasho Karma Wangchuk Penjor worked with the People’s Research Project under His Majesty’s Secretariat. Dasho also worked as the Chairman of Bank of Bhutan, Kuensel, and NRDCL. The third recipient is the Royal Physician, Dr. Tobgyal Wangchhuk. Dasho Tobgyal Wangchuk led the Bhutan Earthquake Relief Medical Team for Nepal in 2015. Dasho has worked as the head of JDWNR hospital and served in different capacities under health ministry. He resigned in 2007 and contested in 2008 elections. In 2010, Dasho received Kabney Patang from His Majesty.